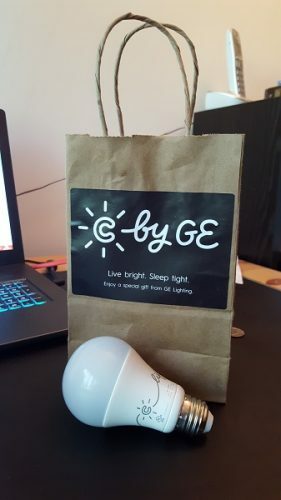 I recently picked up some C by GE smart bulbs at the Maker Faire in DC. The GE stall was giving away samples and I managed to get both versions of their smart bulb line: the life and sleep bulbs. I’ve been meaning to pick up some smart bulbs in order to experiment with dynamic lighting, specifically mood controlled lighting and this seemed like the opportune moment to try it out. Amusingly, I didn’t get very far, after setting up the bulbs and installing the latest firmware the sleep bulb stopped working. The bulb was detected by the C by GE app but I couldn’t turn the light back on. The life bulb still worked but the lighting options are limited and is clearly inferior to the sleep bulb. The light bulb comes with just two types of control: an ON/OFF switch and a dimmer. The sleep bulb on the other hand also allows you to change the colour profile of the white light which is much more interesting as it’s aimed at regulating wake/sleep states. It’s about a week or so after getting the bulbs, and after doing some troubleshooting (e.g. resetting the bulbs, trying different phones) both bulbs have stopped working. Neither are detected by the C by GE app, despite the bulbs still being detected over Bluetooth by the phone. 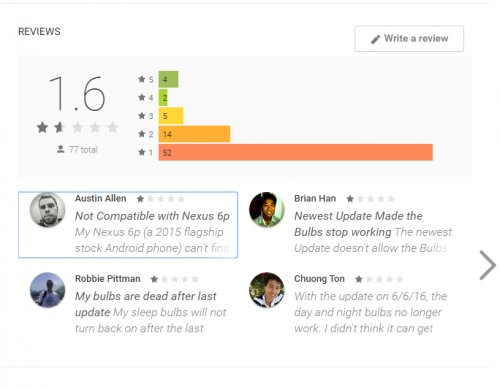 The Google Play page for the app is full of complaints about the latest firmware bricking people’s bulbs so it’s clearly not an isolated problem. I’ve not noticed any official word from GE about the problem on either the store page or their website but after talking with customer services it appears there’s a fix on the way. Sadly there isn’t a release schedule for it so who knows when the bulbs will be of use again. Given the limited illumination controls and a lack of an API I wouldn’t of bought this brand of smart bulb in the first place but it was interesting to test them out and even if I didn’t get very far at least I know what to look for in the future.